OpenSAF has been a popular solution for developers wanting to add High Availability (HA) to their product. 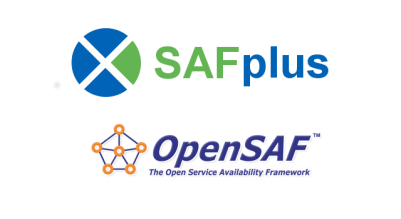 As the name suggests, OpenSAF provides open source middleware software based on the Service Availability (SA) forum’s specification. Whilst this is a great option for developers wanting a low cost, quick start solution for providing five nines reliability, it often falls short when used in commercial product development. Through OpenSAF’s very nature of being built by a number of developers and maintainers coming form a consortium of companies, it has limitations in terms of feature-set, support and integration. Most significantly, when building a mission critical networking, defense or computing product, full life cycle support is of paramount importance. Dedicated engineering support from a single point of contact/corporation is better than that from the general community of users. There is a real need for OpenSAF alternatives that address these important issues. Make versus Buy. When starting a new product or upgrading an existing one, a decision must be made to build all features in-house, or just some of them. If you choose to build all features internally, then oftentimes you will have to staff up to meet the increased engineering demand. However, if you want to save on engineering risk, time and money, it might make more sense to focus on your value-added/differentiable features and buy the other features from an established software provider. The latter approach is the one espoused by SAFplus, OpenClovis’s OpenSAF alternative. By integrating our platform with your product, sophisticated HA functionality can be speedily enabled. The saving on internal engineering effort is more than 4x. Mature and stable HA functionality can take up to 40 engineering man years to develop. SAFplus. OpenClovis’s HA platform, SAFplus, provides capabilities that have been battle-hardened in more than 1,000 installations in operational networks. OpenClovis has dedicated support engineers working for you. We go above and beyond what’s required for you to deliver your SAFplus HA enabled system rapidly and reliably. We will even analyze the bug inside your own system to help you solve your issue, there’s no need to isolate the bug. Our customers are our best sales force – repeat business accounts for a substantial portion of our design wins. We’ve added features that our customers have told us are important, features that were not specified by the SA Forum. A non-exhaustive list includes: hot checkpoint, ability to dynamically modify your HA architecture (add remove nodes and applications, change their redundancy models) while the cluster is in service and advanced logging (connects to syslog, etc). OpenClovis provides an Integrated Development Environment that is an intuitive, Eclipse-based graphical design tool. It lets you architect and model your system resources and their relationships in a simple and straightforward fashion. The SAFplus HA Platform easily coexists with our Management Platform. Out-of-the-box comprehensive functionality is supported, including the full soup of management protocols: NETCONF (YANG), SNMP, RESTCONF, and command line access. The included Test Automation Environment provides comprehensive lifecycle testing system in a distributed networking element. It provides prebuilt, ready-to-deploy test cases for middleware, OS and COTS platform. OpenClovis owns copyright to all of its source code. You will have full liability protection against others claiming to own code that you use. OpenSAF is a great low cost solution for developers wanting to enable basic HA in their product, but shows its weaknesses when used in commercial product development. SAFplus is the preferred OpenSAF alternative and was designed with senior software engineers in mind. OpenClovis believes that today’s developers should have the basic features of a product like OpenSAF, but also include the support, advanced capabilities and reliable operation that a product like SAFplus provides. Whether you are building or upgrading your enterprise, service provider, computing or defense network element, SAFplus is the preferred HA product for those who want the surety of development and reliability of operation that 1,000s of successful deployments ensure.